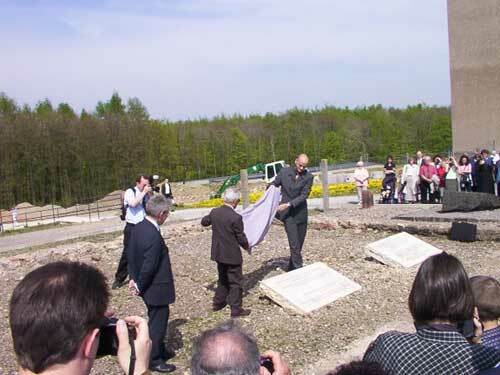 Rikola-Gunnar Lüttgenau, deputy director of the memorial, and Max Liebster, former prisoner, unveil the memorial stone honoring Jehovah’s Witnesses on May 9, 2002. 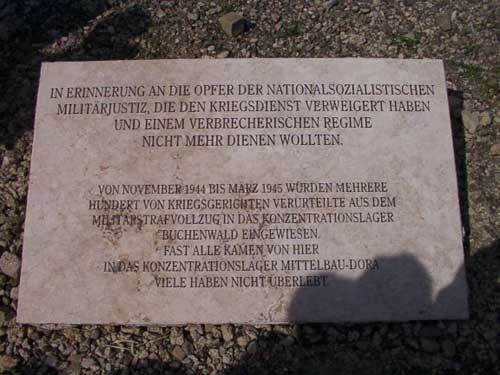 Memorial stone in honor of Jehovah’s Witnesses who were incarcerated in Buchenwald from 1937 to 1945. Memorial stone honoring other conscientious objectors. The two memorial plaques have been placed at the former site of the prisoner barracks, which were demolished in the early 1950s. The stone building in the background of the photo served as the camp storehouse. 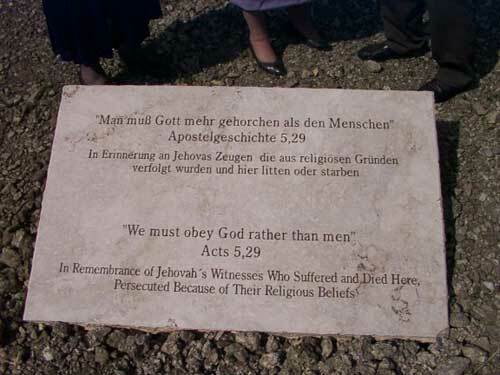 On May 9, 2002, a memorial stone was laid in remembrance of Jehovah's Witness victims of Nazi persecution. Between 1937 and 1945, Witnesses (Bible Students) were subject to slave labour, starvation, and mistreatment, from which many died. 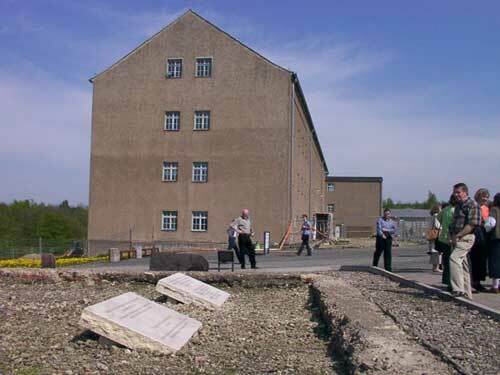 Buchenwald held nearly 650 Witnesses. Incoming Witness prisoners were immediately assigned to the "punishment battalion," which had to do the hardest and dirtiest work. The SS kept them in the isolation barracks in the camp. At first they had no letter-writing privileges, and later they were restricted to one monthly letter of 25 words.